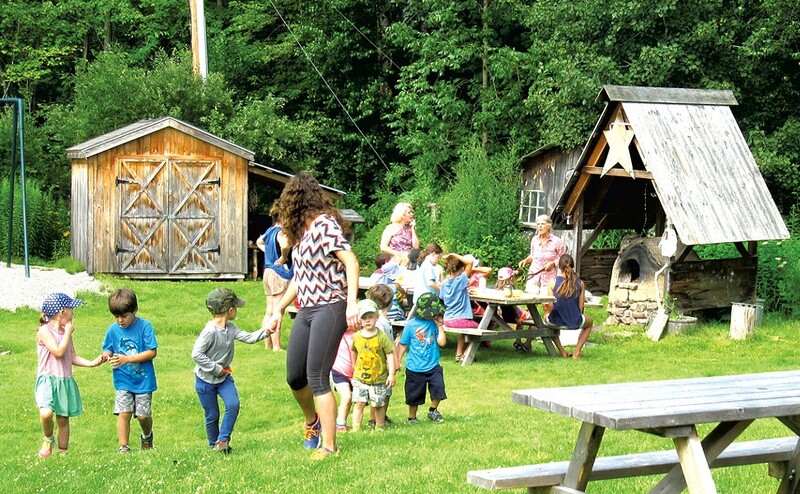 Traditions Bring Kids Back to Summer Camp | Camps | Kids VT - small people, big ideas! I didn't go to the same sleepaway camp year after year, but many of the people I grew up with did — including my husband, Jeff. 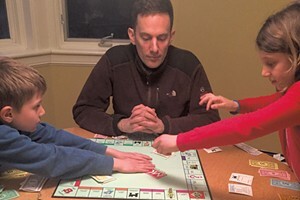 Ask him about his beloved alma mater, Camp Androscoggin in Wayne, Maine, and he'll excitedly explain the annual Color War, which started with a helicopter landing on the camp property during mealtime. All the boys rushed out to greet it and the competition officially began. 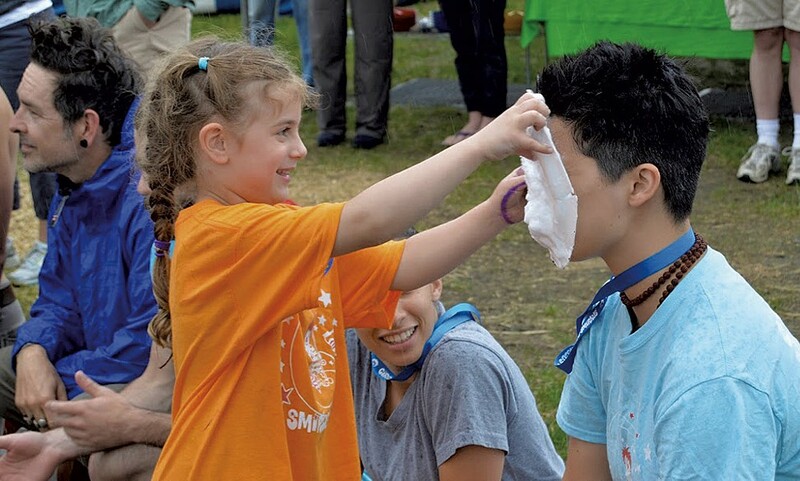 Not every camp commands a 'copter, but most have rituals that set the camp apart and bind campers together. Doug Bishop, director of communications for the Greater Burlington YMCA, which runs multiple camps in Vermont, says that traditions are a crucial part of the camp experience. Often they create "the memories that kids keep with them for the rest of their lives," he says. This month, we reached out to a variety of summer programs — from specialized day camps to traditional sleepaway ones — to find out about the special traditions that make their programs unique and make kids want to return every year. Each two-week session, campers and staff end the last night at our closing campfire, a decades-old tradition that allows campers and staff to reflect on their time at camp. It includes songs and skits by campers and is held at the Cedar Circle Fire Pit, which was built in 1921 as a tribute to the campers and staff who fought in World War I. At the end of the campfire, the camp director tells the story of the early days of camp. After the story, campers and staff each take turns throwing a stick into the fire. This ceremony, called the Wish Stick ceremony, connects present-day campers to the generations of campers before them. The stick represents their wishes, dreams, hopes and prayers. As the fire burns, the ashes of the sticks float up to the heavens to be granted. The morning after the ceremony, one designated camper scoops up the ashes and saves them in a special place. At the beginning of the next session's Wish Stick ceremony, those ashes are poured into the fire. 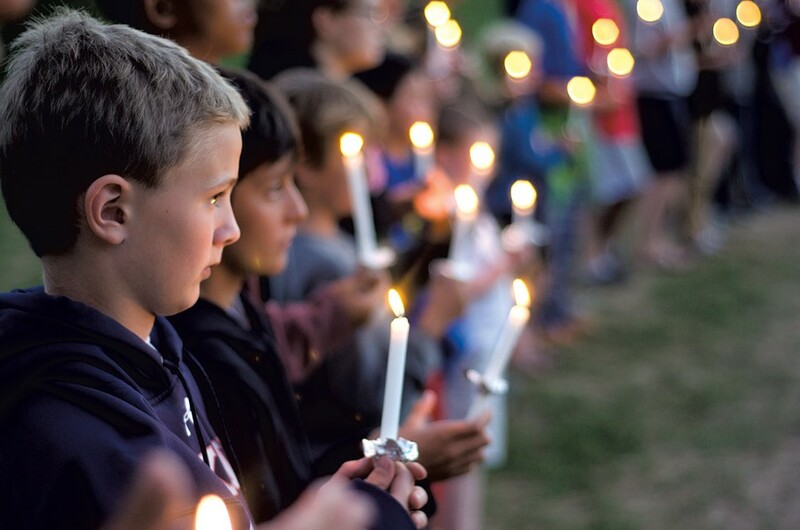 Another tradition is the Candlelight Ceremony, where campers and staff form a circle on the soccer field and listen to speakers while holding lit candles. Every week, Petra Cliffs begins our day camps with our five-finger contract, sitting in a big circle with our campers and explaining rules and expectations. We've been using this for the last 15 years. The thumb stands for encouragement and support for other campers who are trying new things and being challenged. The index finger stands for communication. We don't hold up the middle finger. The finger itself isn't bad — we definitely need it for rock climbing — but it represents all of the bad or negative things we want to keep out of camp, like physical fighting, using inappropriate language and being mean to each other. The ring finger means commitment. Finally, the pinky finger stands for safety. We seal the contract with high fives around the circle, then break into a giant icebreaker group game, and finally separate into our smaller groups to get going for the week. Being a primitive camp, Night Eagle's traditions stem from woodland activities. 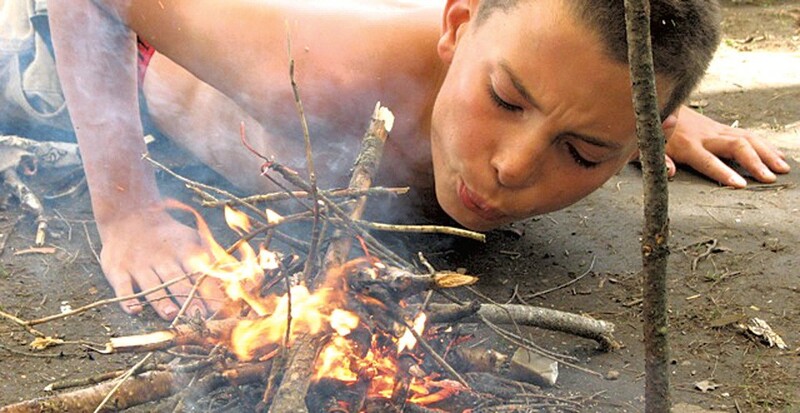 In order to encourage our campers to build a fire with a homemade bow drill, hand drill or pump drill, we give a pint of Ben & Jerry's ice cream to any camper who can successfully build a fire with any of the above-mentioned techniques. Another tradition is our Night Eagle Olympics, which involves throwing tomahawks and atlatls, canoeing, racing, shooting arrows, and building fires with flint and steel. Every meal that we share during our Farm and Garden camp is preceded by our Snack Blessing. Once everyone is settled at the table, around the fire or in the grass, we take a few deep breaths and then say together — while doing accompanying hand motions — "The Earth who gave to us this food / the Sun who made it ripe and good / Blessed Earth and blessed Sun / We won't forget what you have done." It gives us time during the busy day to show gratitude for the natural world that we spend our week immersed in, and provides space to discuss where our food comes from. The campers catch on quickly, and many parents have told us that their kids bring it to the dinner table. We also sing a song called "Dirt Made My Lunch" when we're feeling silly. If it goes over 90 degrees on a given day, everyone at camp gets a Popsicle in the afternoon. So instead of complaining about the heat, the kids are excited for the warm days. We pass out the treats and have a quiet "Popsicle meditation." It is very refreshing, and then we're ready for a bit more art making at the end of the day. This tradition has been happening for over 50 years: A camper and counselor for each age group are chosen to speak at the bonfire and share what Hochelaga means to them. Each girl has a candle that is lit from the fire, soft camp songs are sung and the traditional walk to the waterfront takes place. There, two swimmers swim out with torches to a wooden "H" and light it on fire. Then the girls stand on the edge of the water, make a wish and place their candle into the water. Later the girls return to their cabins and write themselves letters, which are collected and mailed back to them at Christmastime. One of the most special traditions is our Community Tree. This tree sits atop our hillside and holds signs depicting our six camp community values. At the end of each residential session, our campers are given a copper tag with their name engraved and they're able to add it to this tree. It's a special feeling, being able to add your name. It's even more special for each session's "community leader" who is recognized in front of the entire camp and has the privilege of adding his or her name first. One of the greatest visions is watching campers return year after year, looking for their names from previous summers. Once a week, our counselors dress up during the evening workout and "visit" the camp as strangers who know nothing about gymnastics. The time is filled with crazy antics with our counselors moving from apparatus to mats, with screams of horror and laughter from the campers. Our evening dip in the lake each night as the sun sets is another tradition. "Dress up" dinner is a weekly event, with a trip to Seb's Snack Bar for the campers with the craziest costumes. Our weeks are themed Earth, Air, Sun and Water. During Sun Week, we celebrate all things sunny and fiery. Our beloved kindergarten teacher, JoAnne, visits and, with campers, she builds a fire in the dragon oven. Campers then bake fire bread, look for signs of the sun in nature and share stories about the sun within us. An important tradition at our camps is our morning open-studio time. When campers arrive, they choose from a variety of self-directed, creative options. Choices include working with art materials such as watercolors, colored pencils, oil pastels and markers; drawing in one of our "alternative" coloring books that leave lots of room for imagination; playing with one of the many natural treasures or other cool recycled objects or toys in our Imagination Station; or reading a book in English or French. That's accompanied by soothing music. This quiet window of choice is a wonderful way to start the day and allows for participants to grow in their confidence and decision-making skills. 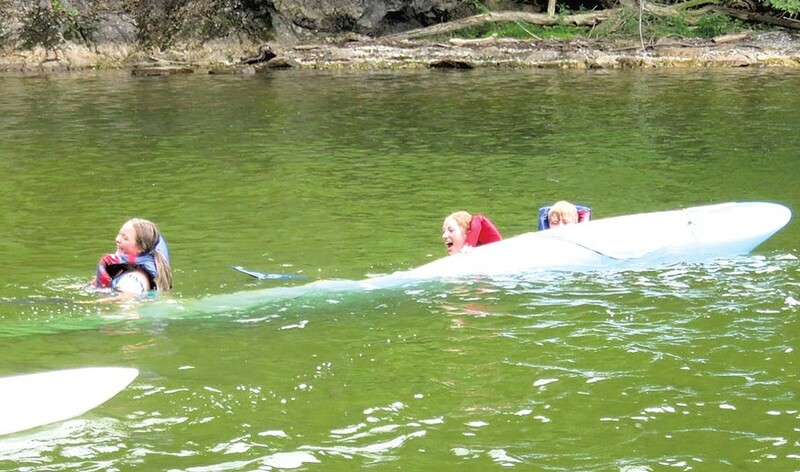 In order to use the canoes and go on paddling expeditions, one has to pass a tippy test. Paddle out, safely tip over, get back into a canoe filled with water and hand-paddle it back to shore. Good skills to learn and hysterically funny to watch and participate in! Our closing event for residential camp is called the Episco-Disco. It begins with campers dressing in nice clothes — from clean T-shirts and shorts to dresses and bow ties. There's a fancy banquet dinner, crazy group games, a dance in the Craft Cabin with a disco ball and a closing campfire to end the evening. Our Discovery Dynamos program, for 3- and 4-year-olds, and our Trailblazers program, for 5- and 6-year-olds, has a parade every Thursday to celebrate the week of fun. The children make costumes based on the theme of the week, and then participate in the weekly parade. Families are invited to come and watch. Our costumed characters, Mogul Mouse and Billy Bob Bear, join us for the fun. Our other great tradition is our weekly Sound and Stage camp. It's a performance-based session where the children create a performance (usually involving dancing and singing) and work on it all week long. At the end of the week, they perform at the Thursday parade and then again at our evening family event, the Vermont Country Fair. The children love creating their own choreographed dance. Throwing a pie in someone's face is a classic circus gag, so of course it is a central part of Smirkus Camp activities. Pie Day happens every session at Smirkus Camp. Our clown coaches teach campers how to properly throw pies at each other and how to take a pie in the face safely. Contrary to popular belief, the pie is actually made out of shaving cream, which is not sticky and doesn't attract bugs like whipped cream does. Campers have the option to pie each other, and counselors and coaches line up so that campers can practice pie-ing them! Get out your summer calendar! If you haven't already signed your kids up for camp, it's time to take action. Check out all the programs advertising in this year's Kids VT camp guide and find more information in the camp directory.